Providing furniture refinishing, repairing and restoration services for Maryland, Northern Virginia and Washington DC areas for over 100 years. Refinishing your furniture can make any piece look immaculate again. We pride ourselves in furniture repairs of enduring quality. We set the benchmark for repairs that last. Our furniture restoration services can help bring back memories of yester years. 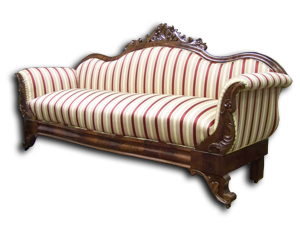 Furniture restoration done right is a delicate process which requires a lot of attention to detail and patience. Reupholstery can add new life to any furniture piece. Antique furniture can look as new again or have a completely new unique look. Harry C. Johnson & Son Inc. has been providing furniture refinishing and repair services to the Washington area for over 100 years. Based out of Gaithersburg, Maryland, we are dedicated to the repair, restoration, refinishing, reupholstering of your furniture and woodworking with unmatched experience and quality. Our work stands the test of time and we stand behind it. Please take a moment to check out all the contents of our website, it is honest and concise, the images within the image gallery are from actual items we’ve worked on, since our website is fairly new, we are working on bringing more photos of the wonderful assortment of antiques and all kind of old stuff we work on , from inexpensive to some of the more valuable antiques on the globe, all feel right at home in our busy workshop and all get the same level of expertise and attention. Feel free to visit with us, there is always something interesting going on, we occupy two plain warehouses, sorry no showroom here. Our complete dedication to our craft and our customers surprise to discover a world they thought was gone. All work is done by us in our workshop from start to finish, we don’t sub-out anything. Please take a moment to read our customer reviews on Angie’s List, we are the proud recipients of their Super Service Award for 2010 , 2011 , 2012 , and judging by the accolades we’ve gathered so far this year, we may win it yet again in 2013. Only a very small percentage of businesses receive this award and to win it year after year is no small feat. Our customers’ testimonials are evidence of our great service. Thank you to those who’ve remained loyal over the decades, we would not be here if not for you. Our repeat business comes from loyal private customers, collectors, dealers, designers and stores. Some of our customers include the following distinguished clients. Visit our customers page to see more businesses that have benefit from our services. Furniture Refinishing and Repair Services for Maryland, Virginia and Washington DC. Our furniture refinishing process is a slow delicate process which is all done by hand using years of wood refinish experience. Our familiarity with Old World methods of construction and finishing, combined with a lifetime of restoration experience. We are extremely well pleased with the refinishing work you did on our table, it is a family heirloom that dates back to the 19th. Century, I have presented it to my grandson who was familiar with its decrepit state and he’s ecstatic.